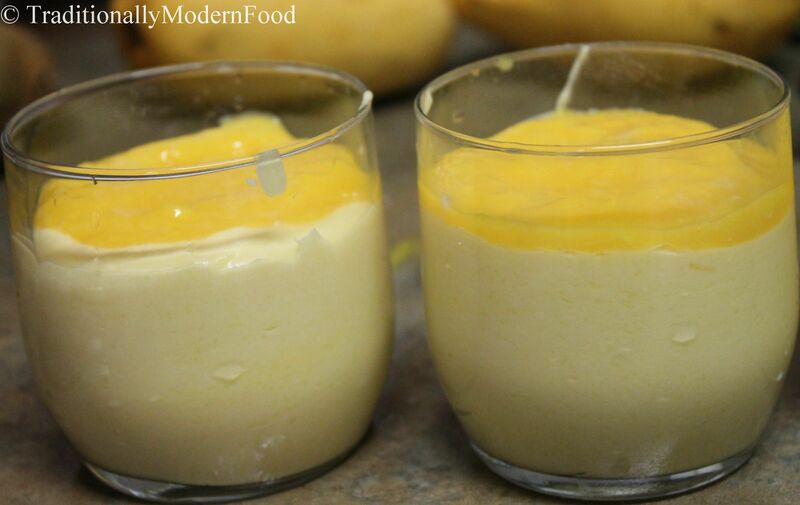 Mango mousse is super and tasty dessert with just three ingredients. This egg-less, gelatin/agar-agar free recipe is yummy dessert for mango season. My husband and I are extremely addicted for mangoes. We long for Alphonso and banganapalli mango we get In India. Mangoes we get here are different, but still when mangoes are in the season no grocery trip without mango. We recently went to Indian restaurant for lunch, in buffet mango dessert was one which I enjoyed a lot. After returning home I couldn’t resist myself from trying this tasty delicacy. I love easy recipes which involve less ingredients. 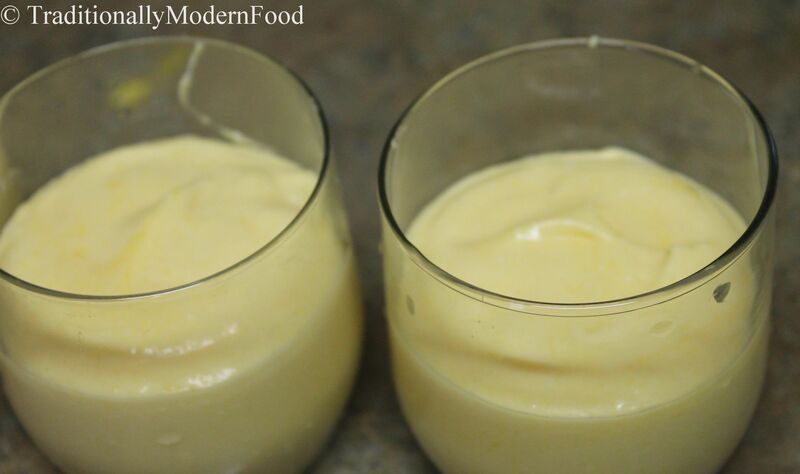 This one with just three ingredients makes this mango mousse even more special. Yes you heard me right. If you have some heavy cream and mangoes time for this rich and creamy dessert. Whisking heavy cream takes time and little effort but the taste answers all the whisking. Absolutely wonderful!! I love that you made it without eggs …so simple and yet so refreshing! Awesome idea! This looks soo good! I love anything with mangoes in it!! Mango pudding [cook mango juice with milk or, for a richer version, ›30% cream, + corn starch] with a topping of mango jelly is also always a compliment fisher. It takes a bit of time though because you you obviously gotta prepare the jelly first, let it set in the mould & only then you can put the pudding on top & then that needs to set as well. & then for extra wow factor you could for example decorate the whole thing with vanilla whipped cream after unmoulding. I’ve found the pudding tastes much nicer if you let it sit in the fridge for at least 24 h although for the jelly it doesn’t make much of a difference I find. Never tried mango mousse but it sounds and looks like a winning combination. Thanks for sharing! I cannot even imagine what mangoes are like in India. This looks so good. I love mango lassi, so I’ll have to give this a try! Oh that looks so delicious!! I can wait for mangoes to come back in season. I think my grandkids would love this. They like mango…and this would be the perfect dessert to use it in. Sounds light and delicious. This is perfect – looks and sounds amazing. Love mangos and love the simplicity of this recipe. Perfect way to end a meal. These are delightful!! I grew up with mango trees in my backyard, so they are and will forever be one of my faves! I make a similar dessert for a quick easy summer treat when I don’t want to deal with the heat from the oven. Addictive!! That’s a simple yet winning recipe for any occasion! I mean… not a soul on earth could resist this mousse! And just yesterday my husband was asking me if mousse without eggs was possible and I wasn’t sure. Now I know! Gonna try this out! Definitely perfect for mango season! I love all those wonderful flavors and that it is no-bake. Yum! I can’t wait to share this recipe with my sister in law. She does not eat eggs and LOVES mango. I know she will just love this. Your mango mousse looks delicious and so colourful too. I would love to try fresh, ripe Alphonso and banganapalli mangoes I can only imagine how good they must be. Can I use canned mango pulp for this? I bought some today from the Indian store. I was going to make pudding but I happen to have whipping cream so I think I’d rather do this! Easier. Lol.